More than being a surprise, Italy’s failure to qualify for the 2018 Football World Cup can be described as the last straw that broke the camel’s back. Even the most sanguine Italian soccer fan was aware that the Italian national team had long lost its competitive edge and sooner or later was destined to bite the dust. Without the heroes of the past decades, all that was left was a squad of ordinary players drawn from the ever-decreasing Italian members of the major Serie A football clubs. Players of the likes of Rossi,Tardelli, Altobelli, Baggio, Pirlo, Totti, Cannavaro, Del Piero - just to mention a few champions of yesteryear – have gone down into history leaving a vacuum that has remained unfilled. Yet despairing Italian fans in Italy, Australia and elsewhere can get some consolation from the experience of other great footballing nations. Having failed to reach the 1990 World Cup, France endured the worst qualification meltdown in history four years later. Needing just a single draw from two remaining home games, France lost first to 51st-ranked Israel and then to 24th-placed Bulgaria. That too seemed like an apocalypse: “Unspeakable!” thundered L'Équipe. “Rocked by scandals and cowardice, undermined by crooks and buried under mounds of money, football is being dragged into disgrace,” remonstrated France-Soir describing the shameful state of French football. France hosted the next tournament in 1998, showing up with a squad of young, attack-minded players, many of them sons of immigrants. They won the championship, thrashing Brazil 3-0 in the final. 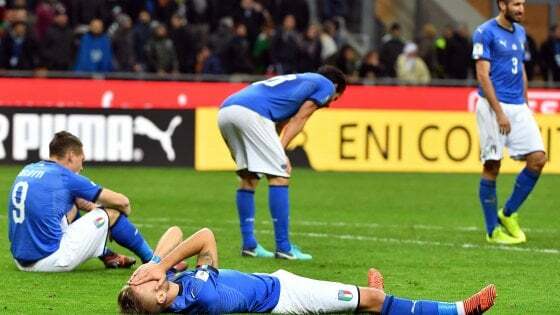 Last October, when Holland, which had reached the semi-finals of the last two editions, failed to make it to the 2018 World Cup in Russia, there was none of the shocked despair that hangs over Italy’s non-qualification. Football in the Netherlands is facing a deep crisis and its fans have become used to under-performance. Since 1982, the team has failed to make it to the World Cup on four different occasions. Dutch footballers were always expected to thrill but not necessarily to win. Even the legendary Johan Cruyff didn’t bag football’s most coveted prize. But Italy is different. The Azzurri have always found a way, even in the worst of circumstances. Italy went into the 2006 World Cup with a match-fixing scandal raging back home and it ended up lifting the trophy. Another scandal erupted ahead of the 2012 European Championship, but Italy emerged a worthy runner-up to Spain. Four years later, Italy went in with arguably its weakest squad ever but still outwitted reigning champion Spain and lost to Germany in the quarter-finals only on penalties. This is what makes the four-time champion missing out on the World Cup, for the first time in sixty years, astounding. It is true that the qualification process left very little margin for error, with only the group topper earning a direct entry. Clubbed alongside Spain, Italy was always expected to come second and be in the playoff. Once there, it was unlucky to draw Sweden, the toughest of opponents. But even so, its performances have been repeatedly poor. In recent times Italy has even registered draws against novices such as Haiti and Luxembourg. There is such a dearth of emerging talent that in the first leg against Sweden, seven of Italy’s starting 11 were older than 30. A lot of blame is placed on the now disgraced coach Giampiero Ventura. He ignored players who were adept and schooled in modern-day tactical methods. Midfielder Jorginho, who has been excellent for Napoli, was only handed his debut against Sweden while forward Lorenzo Insigne, the most creative of the lot, was kept on the bench. Nonetheless, whomever had be chosen to play, everybody knew that Italy’s team had become the shadow of its former self. That said, one could add that Italy is not the only nation licking its wounds. Also watching the 2018 World Cup from their living rooms will be Chile, the reigning champions of South America; the United States, the reigning champions of North and Central America; and Cameroon, the reigning champions of Africa.